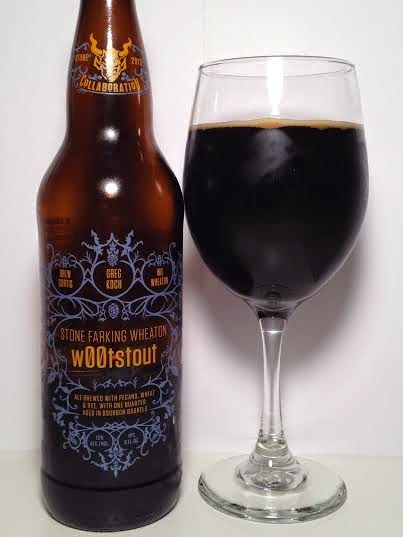 Another Stone Collaboration today as we look at the Farking Wheaton W00t Stout. Bringing together the collective minds of actor Will Wheaton (Star Trek: The Next Generation, Big Bang Theory), Drew Curtis (creator of Fark.com) and Stone CEO Greg Koch yields a 13% Imperial Stout brewed with pecans, wheat & rye with 1/4 of it aged in bourbon barrels. This is "Version 1.0" since they recently released "W00t Stout 2.0" not too long ago. It has been sitting in my cellar for over a year and with the latest version just released, what better time than now to review batch one? Pitch black pour with a small mocha head. If I tilt the glass and hold it up to the light I can get some dark, ruby red on the edges. The first smell I pick up is an initial sweet, pecan aroma. This beer may have only been 1/4 aged in bourbon barrels, but I definitely pick up the barrel character. There's a lot of roasty flavor to the aroma along with some coffee and wood. Unexpectedly, but with arms wide open (not a Creed reference) I welcome a huge blast of vanilla up front. Despite not being 100% barrel-aged, I taste significant bourbon, which is great. A lot of oak, coffee, maybe an espresso bitterness too. Not so much pecan on the taste, but it is there and subdued taking a backseat to all of the other flavors. It goes down so smooth for 13%. It's thick on the mouthfeel, but dangerously drinkable at the same time. I've nearly killed the whole bomber writing this review. Considering the high abv, you do get a warming sensation on the finish. It's not burning or "hot" and it actually moves this big beer along nicely. Stone knows how to make an Imperial Stout and this is just another feather in their cap. Taking the greatness of the style and amping it up with the pecans, wheat, rye, and barrel-aging has made this a delectable, easy-drinking 13% brew. Ensign Wesley Crusher has helped make a fantastic beer. Can't wait to try W00t Stout 2.0!